Explain a supply function (equation) of the form Qs = c + dP. Plot a supply curve from a linear function (eg, Qs = –30 + 20 P). Identify the slope of the supply curve as the slope of the supply function Qs = c + dP, that is d (the coefficient of P). Outline why, if the “c” term changes, there will be a shift of the supply curve. Outline how a change in “d” affects the steepness of the supply curve. NB: If `c´ increases (from 30 to 40 say) supply will increase at very price level (shift to the right) and conversely if `a´ decreases (from 60 to 55 say) demand decreases at every price level (shift to the left). 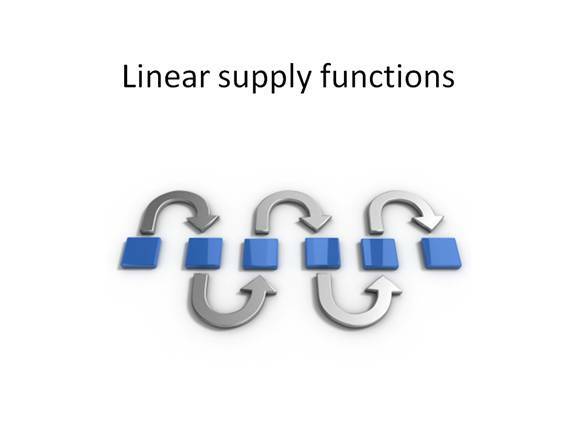 For higher level, you need to be able to understand linear supply functions and to be able to calculate supply and plot a supply curve from a supply function. The presentation below goes through this. Click on the screenshot or link below to open the presentation. It will open in a new web window. You will need a headset or speakers to listen to the explanation.